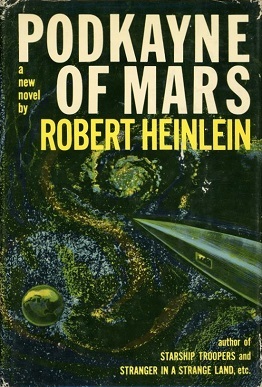 Heinlein, Robert (1963). Podkayne of Mars. NY: G.P. Putnam’s Sons. A human resident of Mars, Podkayne (Poddy) is beautiful charming and intelligent. She wants more than anything to be a pilot and a career woman, though at the moment of writing her journal, she desires to visit Earth with her brother, Clark. Unfortunately due to a mix-up at the fertility lab, Poddy’s mother ends up giving “birth” to triplets and the trip is cancelled. Luckily, Poddy’s “Uncle” Tom–an important diplomat, Ambassador and friend of the family–offers to take Poddy and Clark on a trip to Earth, with a side trip to Venus. Little do the siblings know, their Uncle Tom is using them for leverage in intergalactic peace negotiation between Earth, Mars and Venus. Poddy’s and Clark’s lives are in danger from groups who oppose the peace negotiations. Kidnap, blackmail and possible death loom over the siblings and Tom as they must figure out a way to save their lives and keep the peace. 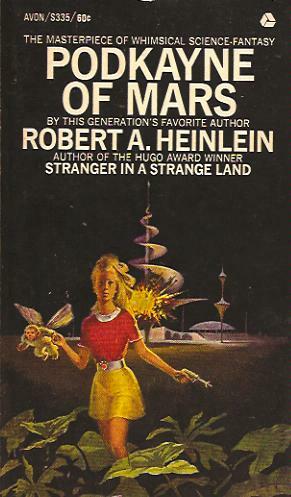 This novel is part of Heinlein’s juveniles for young adults and children. Often hailed as the first feminist science fiction text, Podkayne of Mars is…interesting. I am uncertain if I despise the book, or enjoy it because of the possibilities of dissection it presents. Certainly I can understand an argument for Poddy as a feminist: she wants a career before marriage, she holds power over men, and wants to have it all…in 1963. That is a fair argument. But this book was REprinted in 2010 (see various covers below) and has been reprinted continuously since its original publication. This fact amazes me, because as a member of Generation Y, I see merely an anti-feminist text: Poddy’s power comes from her sexuality, and her ambiguous fate in the end is caused by a maternal instinct to save a fairy baby. She is scorned for her desire to have a career, and as the book progresses her desire for a family and babies slowly overtakes her original ambitions. I intend on exploring these arguments in a paper panel about the “Fantastic Ridiculous” for the IAFA with a comparison to Katniss from The Hunger Games Trilogy. “But it is a mistake for a girl to beat out a male at any test of physical strength” (pg 66). “It does not do to let any man of any age know that one (a female) has brains, not on first acquaintance; intelligence in a woman is likely to make a man suspicious and uneasy” (pg 70). Below are several covers from reprintings over the years.